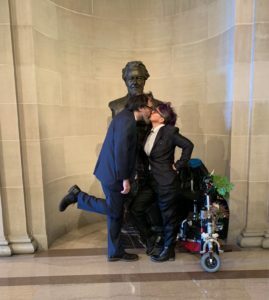 Just Danny, me, my cyborg steed bedecked with flowers, and a looming bust of Edward Robeson Taylor, lawyer and poet & mayor of San Francisco in a time of disaster and deep political corruption. 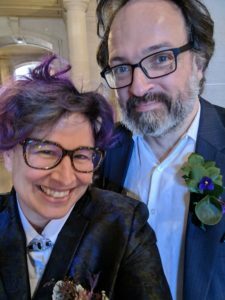 We had a lovely wedding at City Hall with my sister as witness and then went to hang out at the Cliff House and Land’s End. 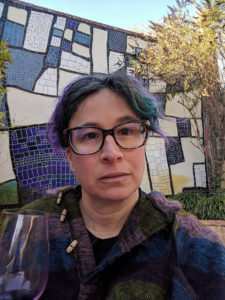 It was fun to elope – we didn’t tell anyone except my sister and our kids, not until the last minute. Looking forward to many more happy years together! And you both look super-sharp in those outfits. Thank you! We really liked wandering around City Hall and reading the plaques and admiring the very strange statues of minor politicians! And it is nice to be married. i send to you in spirit a big stack of purple. thank you! I cannot find a Purple Journey image but here is a pretty Glitch image anyway!